The Northeast was hit by a blizzard this week, so to take our minds off of the weather we’ve decided to start daydreaming about our summer vacations! We love hitting the road with our dogs, but occasionally we run into discriminatory policies that threaten to put a damper on our family fun. Since so many of us like to travel with our pets, we thought this would be a good time to talk with AFF adopter Lynn Rogers. Lynn frequently travels with one of her two dogs, Dakota (who has her Canine Good Citizen certificate and is a therapy dog), but last year, she encountered a rental agency that had breed specific polices. Lynn kept a level head and took this as an opportunity to do some education. Let’s see how it turned out! AFF: Can you tell readers a little about your dogs? Lynn: Both of our dogs are good dogs. We know them very well and we know that Dakota is a real people dog, but Morty is not so comfortable meeting new people. Dakota loves to visit people and new places. However, Morty is afraid of meeting new people and this issue is training in-progress for us. Both of them LOVE going to “doggie” daycare and are favorites there! AFF: You choose to board Morty, instead of bringing him on vacation with you. How come? Lynn: Morty is uncomfortable meeting new people in new spaces. 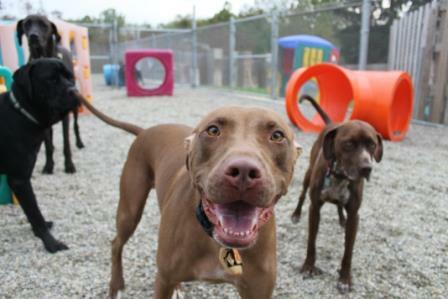 It doesn’t take a degree in dog behavior to see that taking him somewhere new, with ten new people to meet, is not a recipe for success for him. So Dakota came with us and Morty spent his week at our daycare. He had a spa treatment and the trainer there worked with him on his meeting people issues. She and her husband say he is a model dog when he is there, and they take excellent care of him and he gets to play, play, play all day long! AFF: We love how you recognize that each of your dogs is an individual and needs different things to succeed. Since Dakota loves new people and places, you go on vacation with Dakota each summer. What happened when you tried to take her on vacation last summer? Lynn: I found a house with a new rental company, and after I placed the deposit, I received their contract. I noted that the contract included a breed specific discrimination clause which included pit bulls, Rottweilers, Dobermans and German Shepherds. I contacted Animal Farm, asking for advice. Should I pursue having the company change their rules and accept my dog? Or should I just look for another rental company? AFF suggested that it would help move the issue forward if I attempted to challenge the rental company. AFF: How did you approach the rental company and, ultimately, get them to make an exception to their policies? Lynn: I phoned them and explained Dakota’s credentials and her history at past beach houses. I also let them know that I had another dog that I would not be bringing because he would not be comfortable in that situation. They listened and agreed that because Dakota is CGC and TDI certified (I sent them copies of her credentials) that they would bend their rules. AFF: What’s your advice for anyone in a similar situation? Lynn: I guess the biggest lesson for me was not to give up, and to ask for the rules to change. I hope that by bending the rules for my dog, the rental company might see that each dog is an individual. Thanks Lynn! We hope your 2013 vacation is another success! Know your dogs. If your dogs aren’t comfortable with new people or places, taking them on vacation may not be a good choice. It’s ok to leave them at home with a pet sitter or at a kennel. If you do bring them along, give your dogs the skills they need to make a good impression on property managers. Teach them how to greet new people politely. Education is key! If you do run into discrimination, rather than walking away take it as an opportunity to educate. Talk to the rental companies, the campgrounds, or hotel managers. Be polite, calm, and respectful in your approach. Find out why they have a breed specific policy and ask that they reconsider. If your dog has credentials, show them off. Certifications like Canine Good Citizen or Certified Therapy Dog may influence business owners to make an exception for your dog. 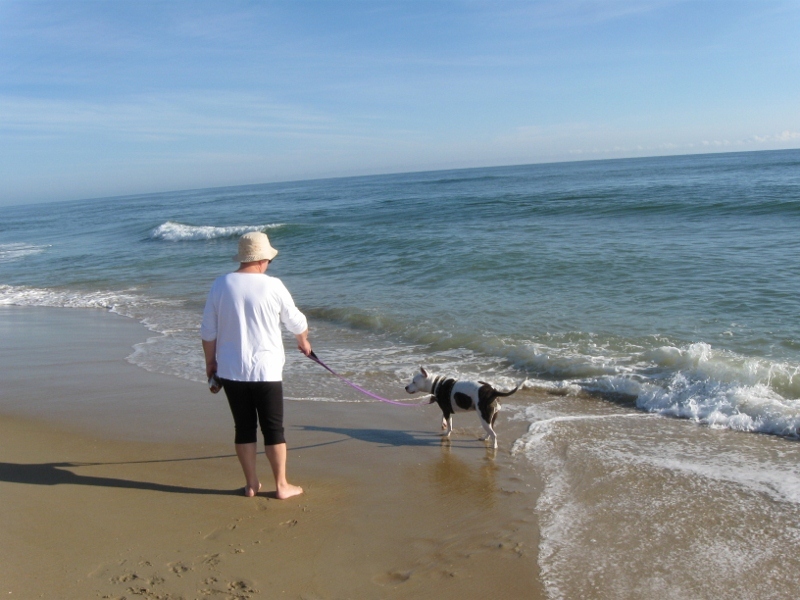 If you’ve successfully rented or vacationed with your dog in the past, mention this. Better yet, if you’ve keep records of correspondences with past property managers (that show you left the house in good condition and are welcome back) share those too. Let your wallet do the talking. If they’re not interested in having a discussion with you or changing their policies, don’t lose your cool. Take your business elsewhere. After you enjoy your vacation, why not write that first company an email to let them know how much money they lost out on by discriminating against you and our dogs? Tell them that you hope they’ll reconsider their policies and that you’d be happy to support their business in the future if they do. Want to be a voice for change, but need a little help getting started? Check out our new BSL Talking Points eBook for tips on speaking up for your dogs!